Just like other huqin instruments, the Chinese zhonghu is one of the more successful examples of reformed instruments. Alongside the gaohu, the zhonghu is usually used to double the erhu. It is typically assigned the alto voice within the Chinese orchestra’s bowed string section. The shape of zhonghu is slightly bigger than that of the erhu, with a soundbox made from wood that ranges in shape from circles to octagons. The zhonghu is often used to accompany other instruments in ensembles and Chinese orchestras; nevertheless, it is perfectly capable of performing solos, despite rarely being viewed in that capacity. It is debatable that the Chinese zhonghu is the equivalent of the Western viola. 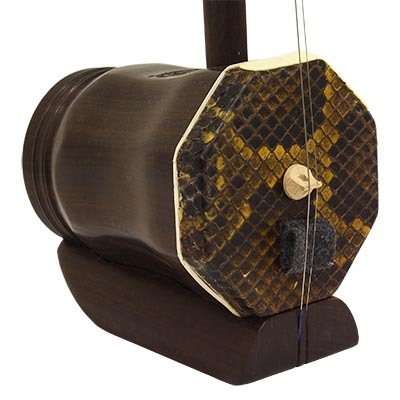 This Chinese fiddle is designed to play middle to lower range notes within the bowed string section; some technical skill is required in order to play higher-pitched notes. The sound of the zhonghu is well-developed, and possesses a slightly nasal quality. Although the zhonghu shares the same instrumental techniques as the erhu, it is relatively less flexible, due to tension of its strings. It is commonly thought to possess a rich, mellow texture, thick timbre and deep tone. Want quality Zhonghus from a trusted source?